How many of us can build a model with perfect joints and no blemishes? Even if the building is perfect we all get the odd small dent here and there. 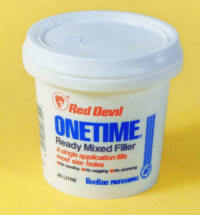 Red Devil Onetime filler is the perfect solution; it spreads straight from the pot, and sets without sagging in a short time depending on thickness.